The VX-410 Series Portables features and performance are housed in an ultra rugged, compact case measuring only 2.3"(W) x 4.3" (H) x 1.2" (D), & weighing less than of a pound with the standard FNB-V57 Battery. Designed for use under the most demanding conditions, the VX-410 series Portables are built in compliance with MIL-STD 810 D/E/F specifications for reliable operation in environments including shock, vibration, high and low temperature, low pressure, rain, humidity, salt fog, and dust. 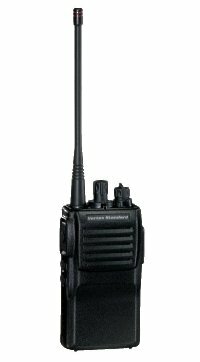 communications capability in hazardous operating situations. Included in the IS certification for the VX-410 series is approval for use in dangerous hydrogen and acetylene environments.